Terraria developer Redigit would love for mod support to act as the "final" update to his game. Terraria has been in the spotlight again lately, as despite being four years old at this point, it is still putting out extensive updates and releasing on new platforms. The folks over at PC gamer caught up with lead developer and creator Redigit, and picked his brains about the game's future. While he himself will no longer be working on the game, Redigit says that smaller, more frequent updates are one of the remaining team's new goals, and even mod support as a "final update" is a possibility. "[1.3] will be the last update that I work on personally so it is hard to say what the future holds. That decision will be left up to the team that continues to work on Terraria," he said. "We like the idea of switching to smaller more frequent updates moving forward." He added that "We have always felt that Mod Support would be the best final update to Terraria so that the community could keep the game alive." One thing that won't be added, however, is a new "final" boss. 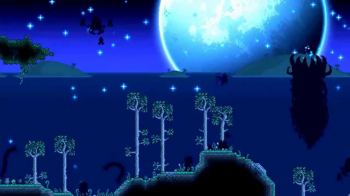 1.3 added the "Moon Lord" which was toted as the final boss of the game, something that Redigit would like to remain as such. "This will likely be the end of the game's progression, but we do intend to continue updating. There is a lot we can do without pushing progression further. We have a lot of ideas for new mechanics and alternate biomes"
Redigit also stressed that there would never be any paid DLC content for the game. "As a gamer I have never really been a fan of paid DLC." The developer also had a few things to say about Steam's somewhat controversial Early Access program. " I would not have done Early Access had that been an option. I would have continued to work on the game until I felt it was ready for release. Because Terraria was leaked, I felt forced to release the game sooner than I would have liked and worked towards getting it to my ideal release state."